No other analytics tools for interactive applications in the market can allow you to conveniently and strategically define, collect, visualize, and share the performance data the way Intuiface Analytics does. We are pretty proud of it. But that is not to say Intuiface Analytics is perfect. If we were to believe anything we achieve is perfect, we’d have no more work to do. So here’s another example of how we give up on being perfect for making a continuous improvement - NEW FEATURES FOR INTUIFACE ANALYTICS! We are excited to announce a new chart type, Single Value Chart and Unlimited Dashboards feature for Basic Plan. It’s the classic way to present a Key Performance Indicator (KPI): display the latest value for a target measurement and optionally compare it to the previous period’s value to visualize progress. Paired with many formatting and customization options, the Single Value Chart may very well become the most common chart type used in your dashboards. 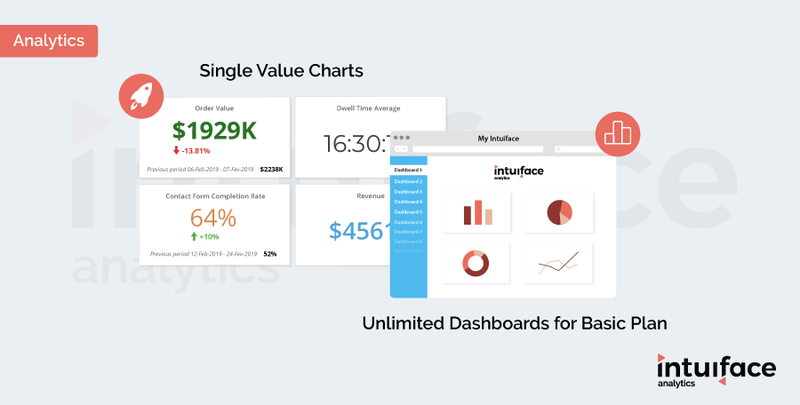 You convinced us - limiting the number of dashboards in the Basic plan for Intuiface Analytics didn’t make sense. As of today, both the Basic and Ultimate plans for Analytics support the creation of unlimited dashboards. This benefit applies to all existing Basic plan holders as well.